Awesome, you are almost finished your DIY animated video journey, exciting isn’t it. 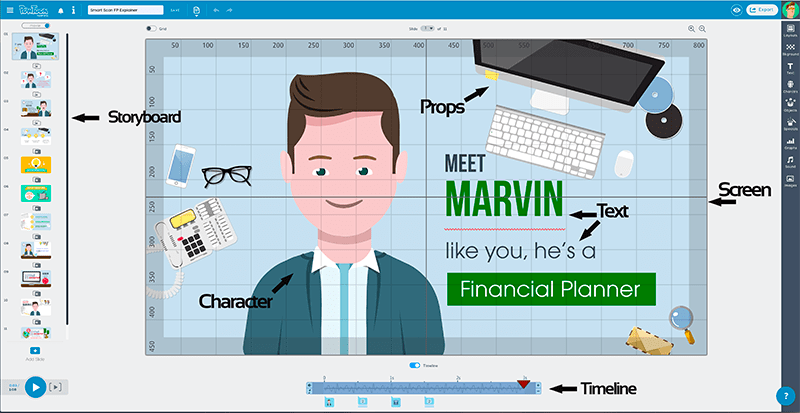 Previous, I wrote about how you can Write a Killer Script for your Explainer Video.But there is an important step between the script and using your DIY Animation Tips for Explainer Videos. The Voice Over needs to be recorded. All you have to do is source either a male or female voice from the web that you like and instruct them on the particular read that you prefer. I would recommend using an Australian accent to connect with your audience, even though foreign accents are cheaper. Now for the fun part, animating your script. There are lots of ways of doing this. Approach an animation studio where they will build you an awesome video from the ground up, but that will run into the thousands of dollars. You could approach a student and pay in pizzas, but the end product may not what you desired. 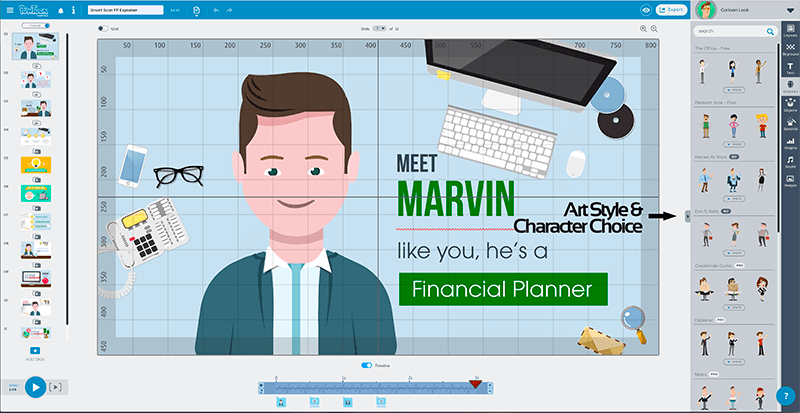 Or you can pay a subscription to a DIY web based animation software platform. They are all essential the same, with slight variations on offer and business model. I’ll be talking about PowToons, GoAnimate, Animator and Raw Shorts. Next, bring your Customer Avatar to life by gender and appearance, all within different art styles. Here is where your creativity comes to life, telling your story using your avatar, other characters, props and locations. Sometimes taking large broad concepts and bringing them home so understand in theory and in application. Although I see this as the fun part, a lot of people who attempt DIY animation usually fall down at this stage. My only advice is to break down your voice over into sentences and tell your story in little chunks. Also, there are very few conventions to adhere to, even those can be ignored if, you make sense. To actually use any of these platforms is easy, as they are all the same. They give you a timeline and an indicator that moves from left to right as the seconds tick away. You then drag and drop any characters or props onto your screen and then decide how long each image is on screen for. That is it in a nut shell. The transitions you use add a quirky visual element with quick “pops” (quick increase in scale) or hands moving images about the screen. Lets take a quick look at each of the platforms I have mentioned. You are aware of these guys because they were one of the first in this space and have been around for a few years. With each of these platforms, there are free versions, but there are severe limitations which makes it hardly worth it. PowToons logo, no video download, resolution restriction etc are among a few. They also have a tiered art style system, the more you pay the more access you have to better quality art style. Stick characters and the like, with minimum detail is available to everyone. But better drawn art work and more of a selection of props make it easy to create an engaging video. Prices start at $46 USD a month. Viewed as the best online animation service. They have really concentrated on industry specific representation. This makes for a more bespoke and prized video. Employs the same timeline and drag and drop interface as all the others. Prices start at $79 USD a month. Similar in every way as the others mentioned above apart from their business model. You pay per download and depending on your requirements, Eg SD or HD, 5 mins or 10 mins, logo or no logo, all add to the cost of the video. Pay per download, buy credits. A valid question would be, “if they are all the same, why choose on over the other?” Two reasons, price, as they are all similar, how much do you want to pay to make your own videos. The other is art style, you would choose the platform that has better art styles on offer. One last step, a music bed. You could upload it with no music bed and choose one from YouTube’s Royalty Free Library. But be warned, those tunes are well worn and may not add anything to your video. The other option is to sign up to a website that sells licensed music tracks, such as Audio Blocks, Pond 5 or AudioJungle. Search the 1000’s of tracks that they have available, pay your money and download it. Now you have your first produced video that can work for your business 24 hours a day, 7 days a week. Remember, the internet is not the “Field of Dreams” with Kevin Costner, “If you build it, they will come”. You have to promote that video to get as many views as possible to drive traffic back to your site. I’m proud that you persevered and produced your own video, the journey has only begun and I’m always here to help. If it all becomes too much, please feel free to contact us for some free advice or ask Reg to take the hassle away and produce the video for you. If you would like to learn a little more before signing up, please visit our Information Page, where Reg will walk you through the process and may well provide a surprise along the way. Otherwise, feel free to call Reg on 040 171 9859 obligation free. After working in TV both in Australia and in the UK, Reg decided to use his production and story telling skills for good. Helping all business owners get to grips with how video can boost business in all areas has become and exciting part of his life. Outside of work Reg is a keen basketball player and coach and enjoys riding his bike along the river. Useful animation tips with creation of explanation video tips. How To Make Your LinkedIn Videos Look Awesome!